For more than 10 years we have offered our Business Navigator as a turnkey navigation solution with thousands of customers. The business navigator is used predominantly in the forestry sector, energy suppliers, and by the emergency services. Special navigation maps for the relevant industry are a key benefit. The NLF wants to optimise the costs of timber supply and timber logistics as a whole in collaboration with contractors. 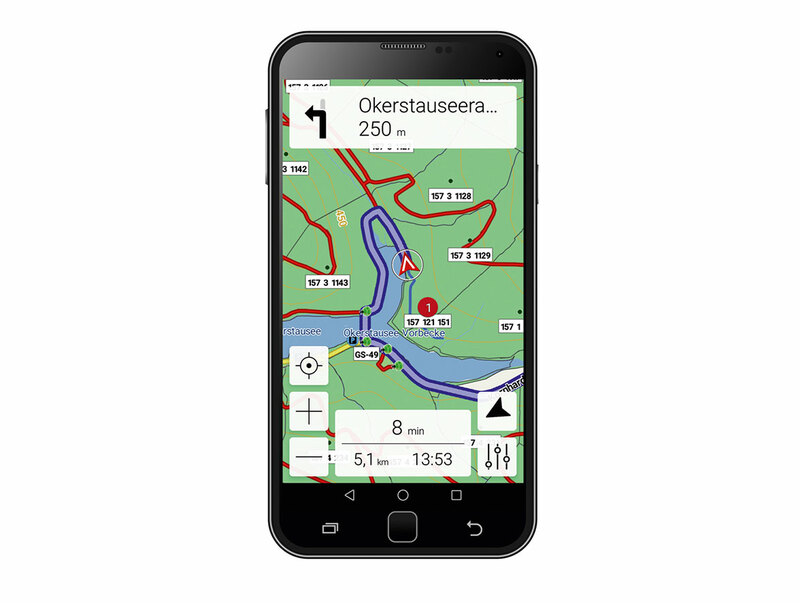 The Forestry Business Navigator holds the key, together with a validated navigation map. Cords are only stacked on classified routes and tracks approved for timber removal. Business Navigator is also used by timber haulage companies to improve timber supply, and not least, for efficient cord removal. Starting point is the forest track data from the internal NLF databases. The initial data is given attributes required for navigation, and is repeatedly checked for quality. To assist the process, localion Q creates analysis layers to make the data easier for NLF staff to handle. A NLF navigation map compiled by merging both databases is then created from the NLF forest track data and current HERE road data in the LOGIBALL map fusion process. This navigation map is compiled for use in the LOGIBALL Business Navigator and regularly updated. The customer receives a complete navigation software package for Windows and Android, and the special NLF navigation map. In the case of the Windows version, pre-installed hardware is also supplied. Regular updates are also made and the customer has access to the highly regarded LOGIBALL support service. I have a problem with the Business Navigator. How does the support service work? Our service is a selling point for follow-on investment, a fact underlined by customer testimonials. We think that the ability to handle your queries regarding our product is just as important as the product itself. That is why our phone support centre is located right next to the development department and not in an outsourced call centre. When you call us, you’ll speak directly to a representative, not a machine. We will then sort out your problem. This is all part and parcel of our service – because in the end, it’s all about your business. Can I transfer individual changes to the road networks to Business Navigator? We are working on this. The solution is already in place for localion B and prototypes are also out there for localion M.
Changes to the road network can be easily integrated through a web application. These changes then only apply to your company or institution. These changes are then promptly distributed through the mobile network to your organisation’s Business Navigators via our backend. These changes are then factored into the next route. Changes to the map are saved. When the navigation receives an update, these changes will still be reflected without having to re-enter them. I have an order management system. Can I integrate Business Navigator? Yes. There are a number of interfaces already being used by partner companies. We are happy to help you link Business Navigator to your order management system. This can usually be done quickly, giving your order management system an edge over your competitors. We are also happy to discuss marketing Business Navigator under your own label. Our main focus is navigation.